Two days ago I had the privilege to present to over 20 Performance Tennis coaches from Hertfordshire as part of the relaunch of the Herts Coaches Association. Who cares how strong you get them! I am in a fairly unique place having worked and specialised in performance Tennis for 12 years. Having been on the shoulder of some fantastic tennis coaches over the years I have a unique perspective which means I can relate all of the S&C work I do to the game. I think that is a massive part of an effective coaches’ tool kit- the ability to turn/TRANSFER kinetic gains in the gym (increased force/power etc) into kinematic gains on the sports field (improved set up and torque during skill execution). The figure above highlights how movement efficiency in the gym in the form of a squat (fundamental movement skill) sets up longer term success in fundamental sports skills such as the set up stance when preparing to hit a ground stroke. You can read more about this presentation in my previous blog Movement skills before Sport Skills, where I discussed LTAD, the Technical checklist and the processes involved in influencing movement efficiency. 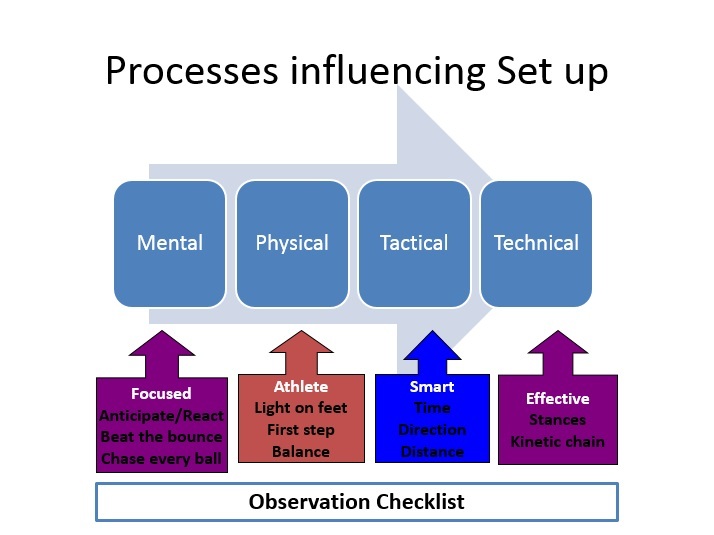 In this blog I want to go into a bit more detail on the Mental processes that influence movement efficiency, or more generally the overall performance of an athlete or team. 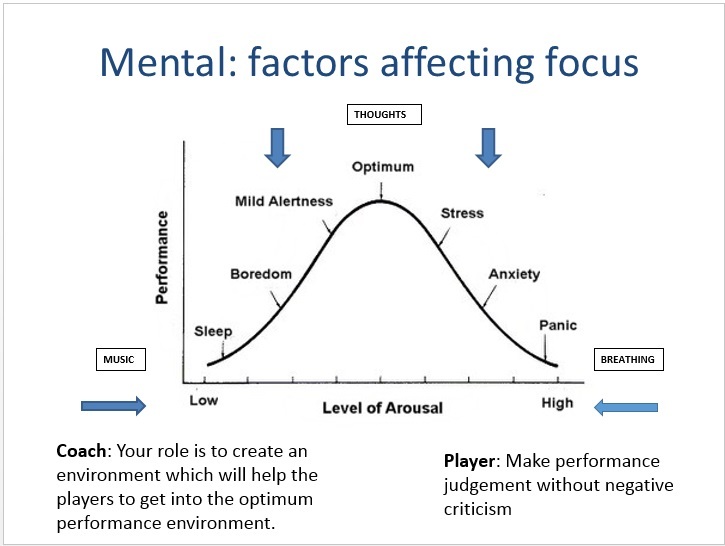 From a Mental Performance factor stand point the ultimate goal is to get your athlete or team into a state of mind where they can FOCUS on the task at hand and give their 100% best effort. My inspiration for this blog came from watching a documentary/interview with Sir Alex Ferguson, who is regarded as perhaps one of the very best in the world at getting the best out of his players over his entire managerial career. When interviewed Sir Alex was asked whether he thought he coached through Fear or Love? He said that he thought it was a bit of both; you needed to know when to give someone a bit of love and an arm around the shoulder and when to give someone a bit of dressing down to get the best out of them. Sir Alex was well known for his ‘hair drier’ treatment of certain players including Roy Keane, Ryan Giggs and even David Beckham. He wanted to let everyone know that no one was too big to get put in their place. Everyone except Eric Cantona, who Sir Alex knew was someone that no matter how reckless or poor his performances or behaviour was he would never respond to the stick. He always needed Love. Christian Ronaldo spoke very highly of Sir Alex and spoke of how considerate of his situation he was when his Father was unwell; he said to Christian, take how ever long you want- one day, two days, a week- your family is the most important thing. We love you here at the club, you’re very important to us but family comes first. We need to recognise that the athlete or team needs to be in the right state of mind to receive the coaching you want to give them. The Figure below shows the number of factors that can influence someone’s focus. Clearly Sir Alex had a great knowledge of his player’s and knew what things were going on in their life that could potentially have an influence on their performance. He clearly knew when to be positive but also when to really challenge someone with some tough words to get a response. 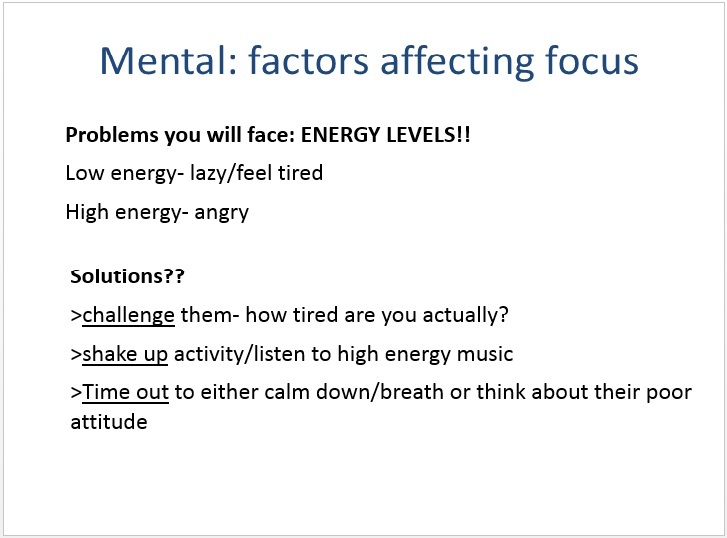 This is the mental ‘stuff’ that an athlete or team will bring to the session that can influence their focus. 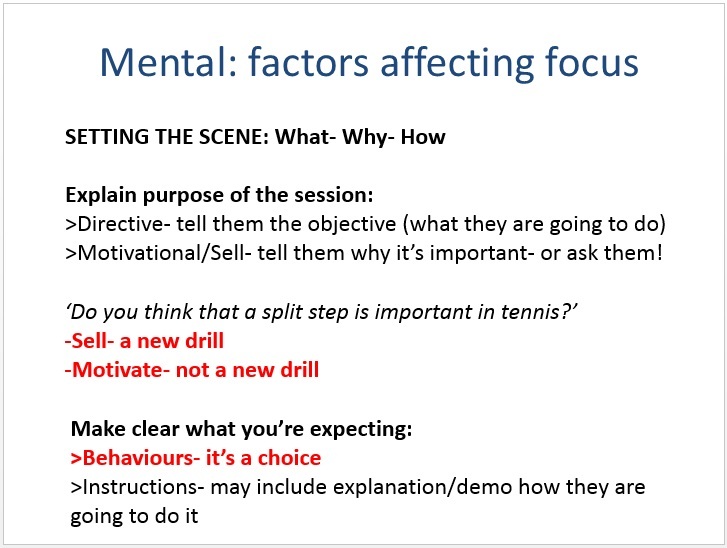 This is the mental ‘stuff’ that we as coaches also need to bring to the session that can influence both our own and our athlete or team’s focus. The combination of the internal and external factors give us the resultant mindset which is part of the Environment you create as a coach. Create the environment- it starts with respect! Sir Alex said that it isn’t about coaching through either Fear or Love, it’s about having RESPECT. He also said it wasn’t about power it was about control. He wanted to make sure that he was in control of everyone and everything. But that’s for another blog about Leadership. Let’s talk a bit more about how someone like Sir Alex might influence his players during actual coaching sessions. Overall there is a need for the individual or team to respect you. If they don’t respect you they won’t listen to you and they certainly won’t want to work for you. We all know you have to earn respect you can’t demand it. Having said that some people who have been there and done it will get instant respect such as former pros who turn managers or managers joining new clubs fresh from success with a previous club. I personally think you earn respect in many ways. I think people respect you when they can see that your methods get results- that helps. From my approach I try and earn respect because my athletes see I stand up to what I believe in and set clear rules for behaviour that I work hard to uphold. Maybe they don’t always like the strict approach but they learn to respect it because it creates an environment conducive to learning and not horse play. I personally start off with a fairly strict no nonsense approach but there is certainly plenty of room for fun too! However, if athletes break the rules then there are consequences for that. When you show someone that you are prepared to go above and beyond to support someone to achieve their goals it builds trust in you that you are there for them. Having an unconditional love for your athletes is really important. It is important to be able to always see the greatness in everyone. If you can’t do that then you aren’t the right person to be working with them. Having a positive label of the athlete is important- don’t label them as lazy, or having a poor attitude, you always need to focus on what they do well and where they are making progress. It’s about being positive. Assuming the athletes respect you they may still need a bit of help to get in the right mindset; that’s why coaches need to be in state of mind where they are neither under or over aroused. > Having a presence- grab their attention! There is no doubt that certain coaches seem to have more of a presence than others. One of the delegates at my presentation apparently remarked to another coach, ‘I thought he was shy?’ after seeing me present! You see, in my every day life I’m quiet and I am not usually the one who is at the centre of attention or looking to get in the thick of the action. I prefer to be in the background and my leadership style is very mild mannered and consultative. Yet in my coaching role, I see it like more than an audition; it’s a performance and people are coming to be entertained. In my presentation I had to keep more than 20 coaches entertained for nearly 3 hours! No easy task! If you have a great presence you can use that to influence the energy of the athlete or group positively. If they are lacking in energy you can rally the troops with your enthusiasm. If they are over aroused, angry anxious and so on, you can calm them down with a controlled but authoritative voice. Both types of communication require a strong presence. The easiest way to grab attention is to have lots of passion and enthusiasm for what you are talking about. People are much more likely to be engaged when they are involved. Before you get stuck into your coaching session if you can see the energy in the group looks low a really easy tactic is to use a high energy game such as tag or any kind of game which has a ball- anything that requires them to compete and concentrate!! Equally if you are about to give them some coaching and they come to you too hyped up or angry, let them calm down first- where you can either call a time out for the entire squad or an individual so they can calm down first. This is a huge part of every coaching session. Now that the athletes are ready to listen with the right mindset you can now set the scene for the rest of the session. 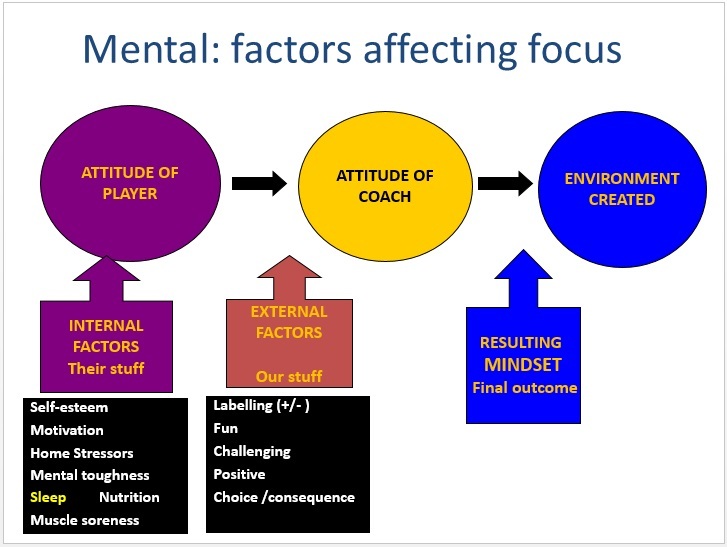 The figure above summarises some of the things I spoke to the Herts Coaches about. Too often we get straight into the drill we want to work on without setting the scene properly. Tell them what they are going to do and then why- which can be done through you selling the importance of it (if it’s a new drill) or asking them why it is important and reinforcing that (motivating them). Crucially you will want to remind them of what you are expecting from them. You may want use demonstrations to show what you are looking for from a performance point of view. You most definitely want to remind them that you are looking for 100% effort and focus. One of the the things I have learnt is that the easiest way to get people to work hard is to set the level of challenge high enough that the only way someone can achieve the goal is if they are focused. Generally speaking games based drills are more fun so rather than just doing closed technical drills, more open drills that involve running and use of a variety of skills are more fun. Athletes always enjoy opportunities to apply their skills. Keep score to hold interest and promote competition and most importantly stretch your athletes by making them aware of world class levels of performance. I think it’s always easier to challenge them by setting the level high and see if they can reach it. To do this you as a performance coach need to have an awareness of standards and know what world class looks like! Too often we might berate athletes for not working hard enough but if we don’t stretch them in the first place they may not have a reason to need to work hard! b) give them a choice if they want to stop or keep going (when the drill is challenging)- but they must know that IF they decide to KEEP GOING they will need to meet the demands of the drill. You can learn a lot about what is going on in the head of an athlete by asking questions after completion of a drill. 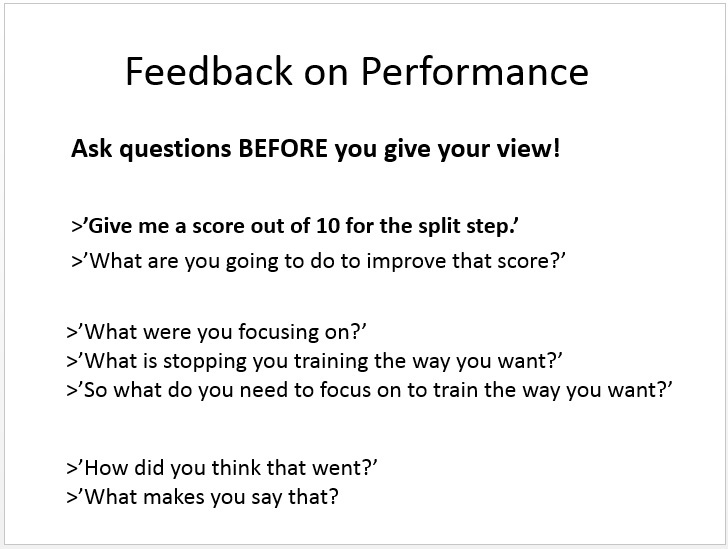 They can tell you what they were focusing on and they can even come up with ideas on what they think they need to do to improve their performance. In my experience, if you give the athlete ownership of their performance they will often harder on the things they have come up with even if you think there is something else that may be more important! Sometimes it’s more effective to let them run with their own idea and see what happens! By doing this you are also showing the athlete you are making them accountable to an agreed level when we set the scene earlier. It is very important to get agreement on the level of performance actually achieved. If it is not of a high enough level they have a choice- either improve to the level required or be asked to stop the session. There is no place for mediocrity! The coaching process exists to provide a framework for ensuring successful performance. In the sessions for Herts LTA and also in the APA workshop I will be focusing more closely how to ensure that physical gains made in the gym transfer into performance. To understand how to do this you need to know the ingredients that determine optimal performance. Before I continue I would encourage you to read a blog article of Keir Wenham-Flatt aka the rugby strength coach- click HERE , on training specificity. 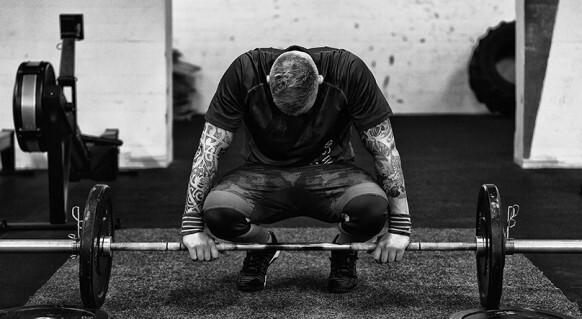 He makes some really good points on why at times the training we do in the gym can be very general in nature, as this is the best way to maximise the capacities of certain biomotor abilities. At other times it is important to train very specifically to enable you to apply your fitness under game conditions. 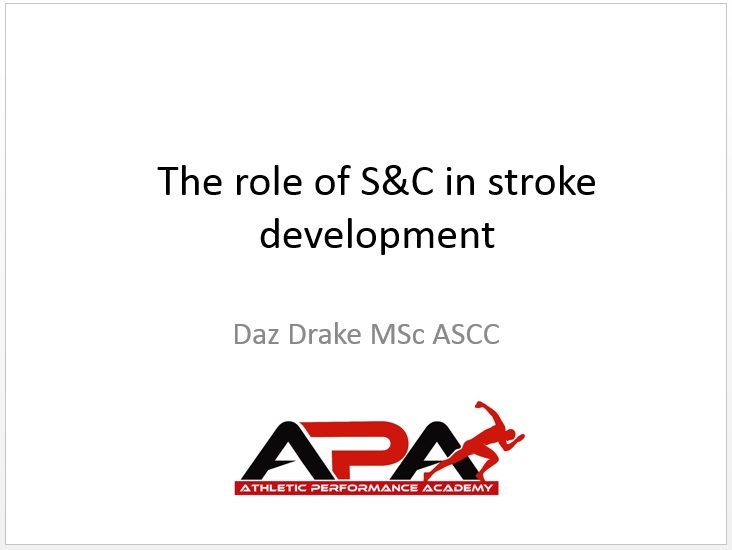 But seeing as many of my presentations will specifically address the needs of sports coaches I will be focusing on the cross-over between S&C and sports coaches when improving sport specific skills. In my presentations I focus on the Mental and Physical factors and then go into detail on how the S&C can work in unison with the Technical requirements of the sports skill action to optimise performance. No presentation on S&C would be complete without some reference to Long-term Athletic Development (LTAD). Below is a graph which I have found very useful over the years. I like to start with this slide in a lot of my presentations as it gives a context for the rest of the presentation. I make the point that yes, those young children who start the sport sooner and do more at a young age will be more successful at a young age. 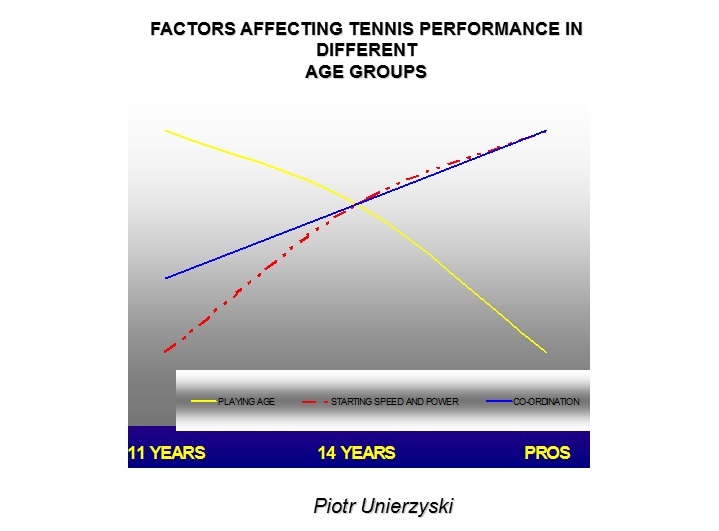 This is because Playing Age accounts for a lot of the success of a young athlete. But over the course of the athlete’s career it is the Level of fitness (specifically speed and their coordination) that affects tennis performance to a much greater extent. Yet so many parents and coaches interpret this the wrong way. They think that because it takes on increasing importance over time you don’t need to address it until much later down the track. In fact the opposite is true, you need to invest in your fitness from a young age so that when you get to the higher levels you have the physical capacities to meet the ever increasing demands of the sport. You can’t cram for the test! You only have to look at how much Andy Murray needed to invest in his fitness when he made the transition onto the ATP Tour and initially struggled in best of five Grand slam tournaments. Most players are not as well equipped to make the adjustments once they get to the Tour. You can’t go very far before hearing someone mention the 10,000 hours debate so I’m going to offer my thoughts on it below. I agree that deliberate practice is key. I also agree that anyone who has become an expert in anything has amassed some significant hours of practice. So how would you go about planning this training? 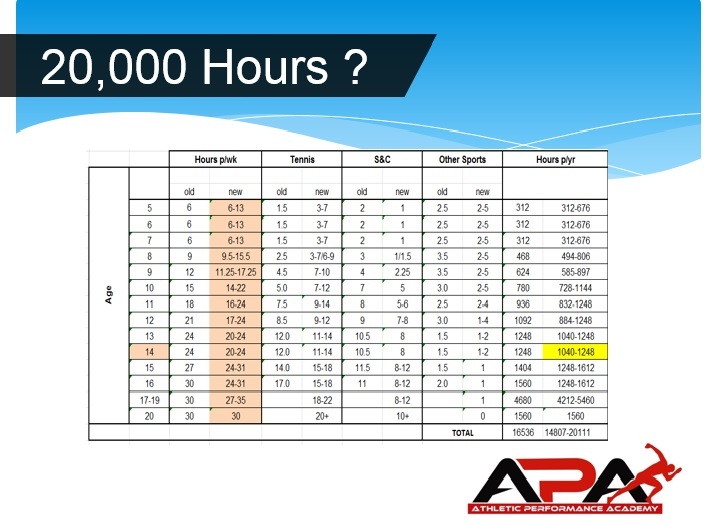 For me the important question is to ask by what point would you have needed to have amassed your 10,000 hours? By the age of 10, 15, 20 and so on? Do you need to get there as soon as possible and will it vary amongst sports and individuals? According to the new guidelines of the LTA, children are now encouraged to play Tennis more than previously advised. They are also advised to play less sport than previously advised (see the New guidelines above). Under the new guidelines, if children practice in the upper limit (which they often do!) this could mean that children starting at 5 years old will have done over 10,000 hours by the time they are 14. Do children really need to do that many hours by such a young age? I am less inclined to focus on doing large number of hours in one sport in the the early years when the focus is on Teaching. In my opinion the important thing is to make sure that the child spends ENOUGH TIME to master the basic skills of the sport- but not too much that they specialise in it at the exclusion of others. Could it be possible that some children with more ‘talent’ could reach the levels of technical mastery in one sport in say 5,000 hours? In my opinion, yes! Therefore I’d be more keen to emphasis playing less tennis than the high upper ranges for children aged 5-10 years, and be in favour of playing other sports. If they really need that many hours to get the basic skills are they actually any good, and even if they persevere are they likely to still be in the game at an older age with the risks of burn out? What I would be more in favour of emphasising is accumulating the hours in the form of Training through adolescence once the young athlete decides to focus on one sport. 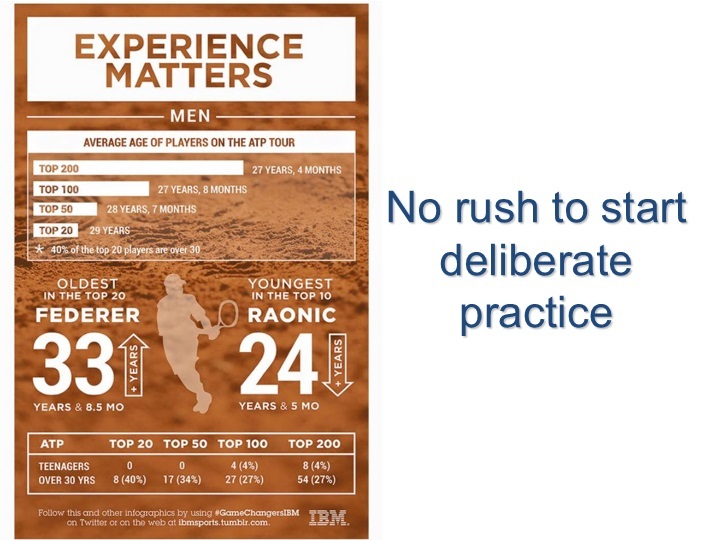 The image above shows that players (at least in the sport of Tennis, which is my main sport I work in) are not reaching the highest level of the game until their mid twenties. Therefore the best time to accumulate many hours of deliberate practice in one sport is in your teens. And the extra time you have in your early years can be spent on playing other sports and most importantly, building your athletic skills. 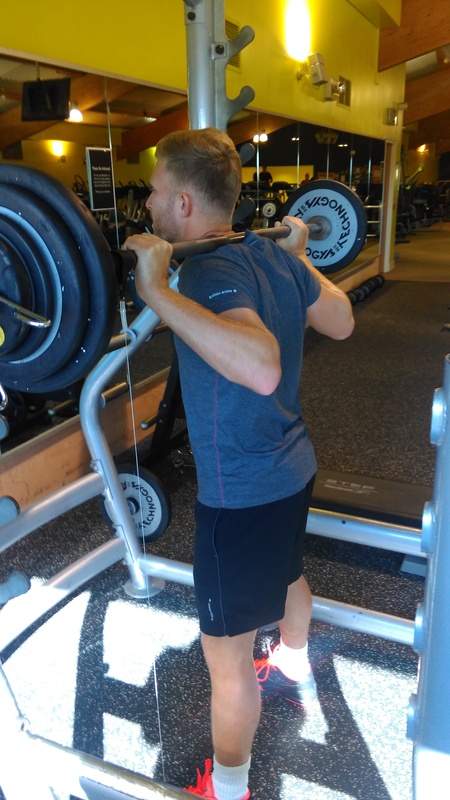 Movement efficiency is the name of the game….in the gym this is easy to measure: the ability to perform movements such as a squat through a full range of motion under control. 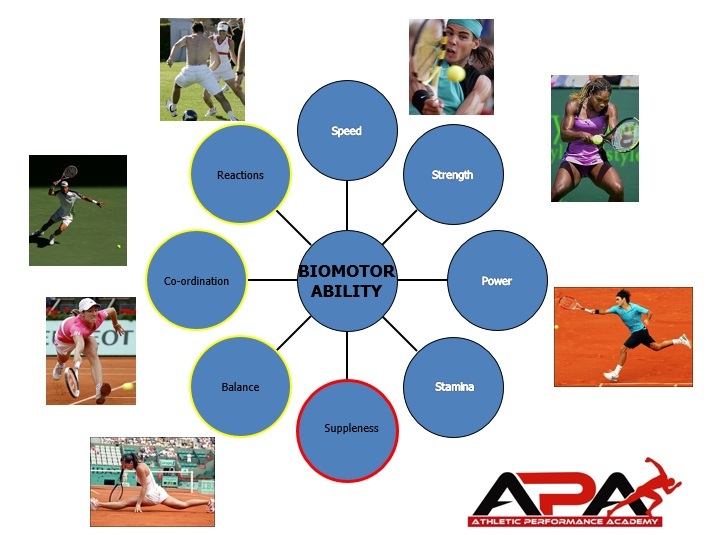 As you can see below at APA we focus on a holistic athletic programme which includes development of the 5 S’s (suppleness, skill, speed, strength and and stamina). This is in my opinion where the ‘movement skills’ training really pays off. If we can improve a child’s general athletic SKILLS (or movement skills) they will be much better able to acquire the complex sports skills. 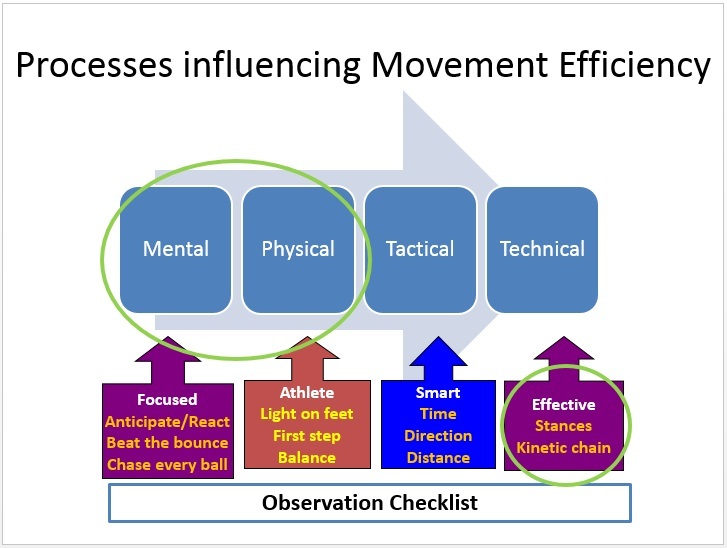 So what does movement efficiency look like for the sports coach? 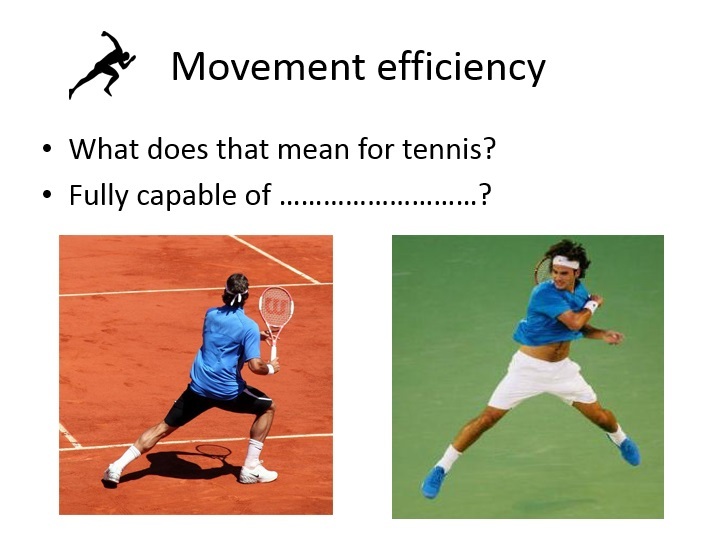 What movements do they want us to help them develop in their tennis player? 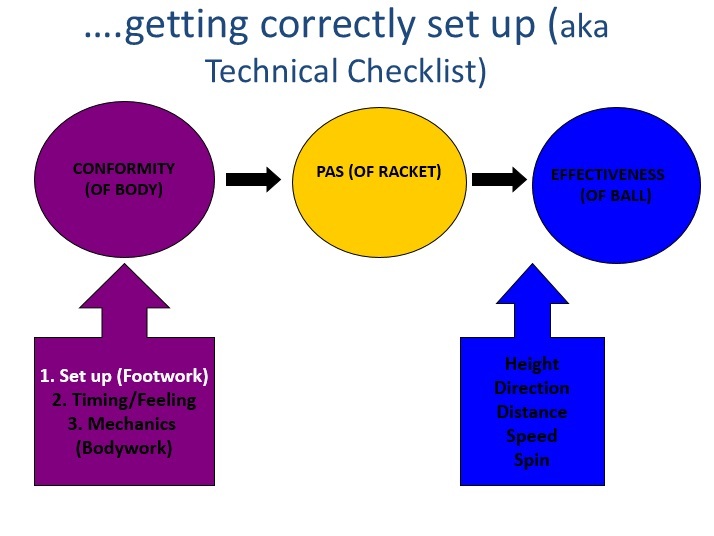 In the sport of Tennis all the work we do to make them more athletic ultimately needs to help them ‘get set up’ correctly- which means getting their feet set up in the right place at the right time to hit the ball while being balanced and using the body properly!!!!! In my talk with the Tennis coaches next week I will go in to detail on the methods I use to develop specific physical attributes of ‘Skill’ that will create a MOVEMENT FOUNDATION on which to BUILD TECHNICAL SKILLS. As you can see above, you can only hit an effective ball using the correct path, angle and speed (PAS) of the racket, IF and only IF you are set up correctly and use the correct bodywork. I will share with the Tennis coaches the Observation check list which needs to be respected before the coaches look to try and coach technique to address errors. It may be that there was indeed a technical error BUT if may have started much sooner in the process- and often their are physical deficiencies which are holding players back from executing their skills. 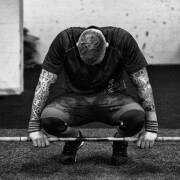 Once the S&C coach can grasp the basic demands of the techniques of the sports skill they will be much more equipped to select specific types of balance, coordination, reaction speed, and even strength and power and stamina activities to ensure a quick transfer to the sport skill. If your job is anything like mine then the month of September is all hands on deck as many of our junior athletes are returning from summer holidays, are back to school and are now getting back to their student athlete lifestyles. Needless to say we have had a lot of athletes to assess over the last few weeks including physical competency assessments, fitness tests and strength/power profiles. With all this data it is important to be able to determine what data is actually useful so that is my focus this year. Athlete monitoring: Goal 1: Is it any good? APA has been recording data consistently over the last four years on a range of Fitness test parameters so we know what good looks like in terms of speed, agility, power and stamina. Since APA purchased the Gym Aware linear position transducer to determine power and force parameters I have been keen to use this tool to deepen my understanding of what good looks like! if there is a power achieved at a specific load that differentiates those at pro level from the second string players in the sports I work in. Tennis: Since I spend most of my own time working in Tennis I thought I would start with that. 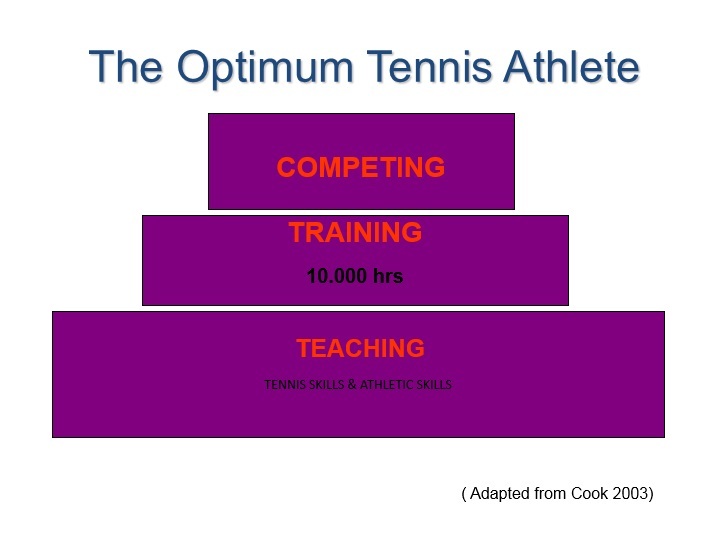 There are many contributing factors to successful performance in Tennis besides physical attributes. So unlike other sports it may not always be the case that the best athlete is also the best tennis player. Other sports such as rugby may be better off assessing absolute power at fixed loads of 20, 40, 60, 80 and 100kg. For example, Dan Baker’s research on professional rugby league players, with whom he worked for 19 years, shows that the power achieved jumping with 80-100 kg really differentiates those at the pro team level (NRL) from second- and third-division players. But for Tennis I am going to look at relative power first rather than absolute power. So this years’s power profile looks at 0, 20, 40, 60, 80 and 100% bodyweight. 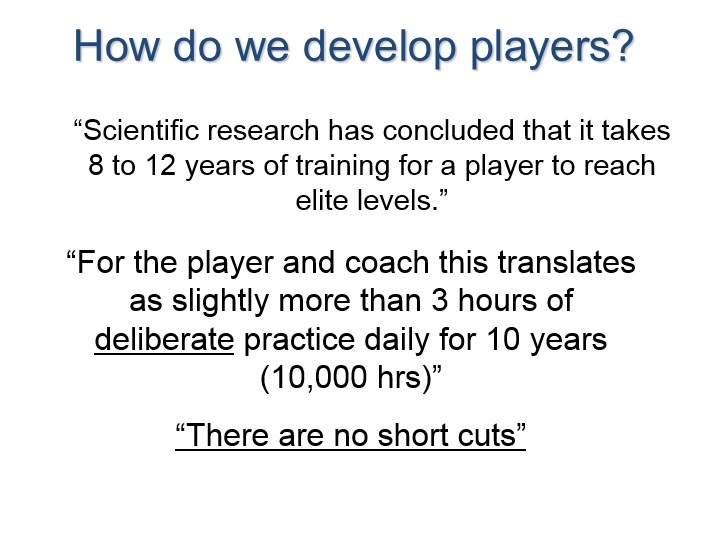 I will be investigating if better players produce more power at certain loads. Athlete 1 was able to generate 78 watts/kg during 20% of his body mass during a jump squat. It doesn’t seem to follow the trend of his profile but for now 78 watts/kg is the highest observed. He is the best athlete (supported by this jump squat profile) and currently is also the highest ranked. Athlete monitoring: Goal 2: Is it any good- measured against the norm? It is clearly important to know what good looks like. It is equally important to know how the performance you are observing compares to the ‘norm.’ Is the change in performance significant or simply within the realms of typical day to day variation? 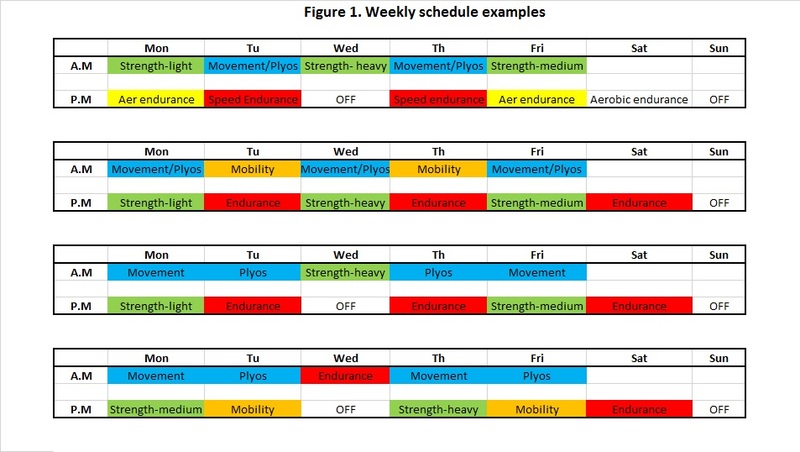 One of the skills of a strength & conditioning coach is being able to plan the training of a professional athlete who is training multiple times per day across both S&C and their sport. Below are a selection of training templates I have either personally used myself or have seen other coaches use. Clearly the stresses of such a full schedule can take its toll on the body (and performance) of the athlete, so it’s important to monitor this. Perhaps the athlete is not responding well to the volume and/or intensity of the schedule. How can you observe this? And then hopefully do something about it before it becomes an issue? I have already mentioned in a previous blog about this but it is worth referring again to some of Dan Baker’s work he used to monitor neuromuscular fatigue. He used a 20kg repeated jump squat x 5 to monitor mean external power. Figure 5. 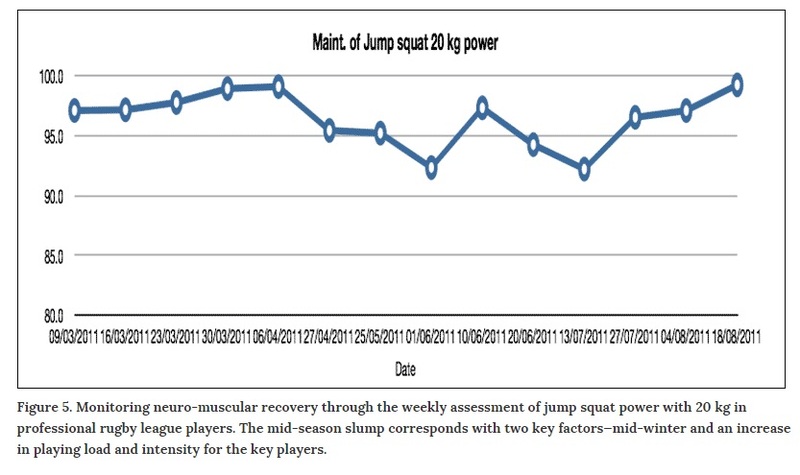 Monitoring neuro-muscular recovery through the weekly assessment of jump squat power with 20 kg in professional rugby league players. The mid-season slump corresponds with two key factors—mid-winter and an increase in playing load and intensity for the key players. Mean– The mean is the average of the numbers: a calculated “central” value of a set of numbers. Standard deviation– A measure of the dispersion of a set of data from its mean. The more spread apart the data, the higher the deviation. Standard deviation is calculated as the square root of variance. Z–Score – A Z-Score is a statistical measurement of a score’s relationship to the mean in a group of scores. A Z–score of 0 means the score is the same as the mean. A Z–score can also be positive or negative, indicating whether it is above or below the mean and by how many standard deviations. This year I will be calculating these numbers for our important variables that we believe will be the most sensitive to change during times of fatigue. So I will be taking the Reactive Strength Index (RSI) at the end of warm-ups at 9:45am and then the Mean External Power of a repeated 20kg jump squat during the start of the strength session at 10:30am. The Z Score of 1.31 shows that the last score of 2.70 is above the mean. Z scores are particularly important when determining significance- when the score has gone above/below the rolling average. Generally a score of between +/-1 and +/-2 is seen as quite a significant change from the average. (A Yellow Flag). Generally a score of greater than +/- 2 is seen as very significant. Therefore the last score would be quite significant in terms of a worthwhile improvement from the rolling average. How can APA help you? 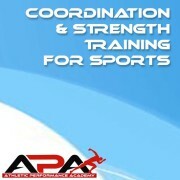 If you would like APA to assess your fitness and write you a programme you can do yourself then feel free to contact us. We would love to hear from you.